This is a pretty long post…It has to be because I am writing after a long time and an interesting subject too. There are many who love bananas. There are also some people who go bananas. So I thought I would write a piece on bananas for which I had an opportunity to ponder upon as I traveled to my home state Kerala recently. Have you ever wondered why the great tennis legend Boris Becker ate bananas during the game breaks . It gave him super energy and his ‘boom boom serves are a testimonial to prove the benefits of banana. Recently I got an e mail mentioning the health benefits of eating this fruit and it ended like ‘A banana a day keeps the doctor away’. They are cheaper than apples and are easily available in any nook corner of our country. Before I delve deep into the subject let me explain how this story flashed in my mind. My trip to Kerala was interesting it always so. She would bewitch anyone with her charm .There is always freshness in the air , the scenery around would keep anyone spell bound. It makes me yearn to be in that place forever. The green fields, the water droplets on the leaves shining in the morning Sun dazzling like diamonds, small rivulets, her virgin beaches and lagoons, ancient churches and temples make this place an enticing one. Coconut palms groves, rubber and banana plantations and tea gardens adorn the landscape of Kerala. No wonder this is called as God’s Own Country. The seeds for this post were sown in my mind when we stopped to take tender coconut water from a street vendor. Lush green banana plantation was on opposite side of the road and I didn’t lose time in giving some work to my camera. Whenever I make a trip to Kerala I make a list of ‘must buy things’ and every time bananas; a variety very common in Kerala find a way into my list. It is known as Nendra pazham or ethapazham in local parlance. 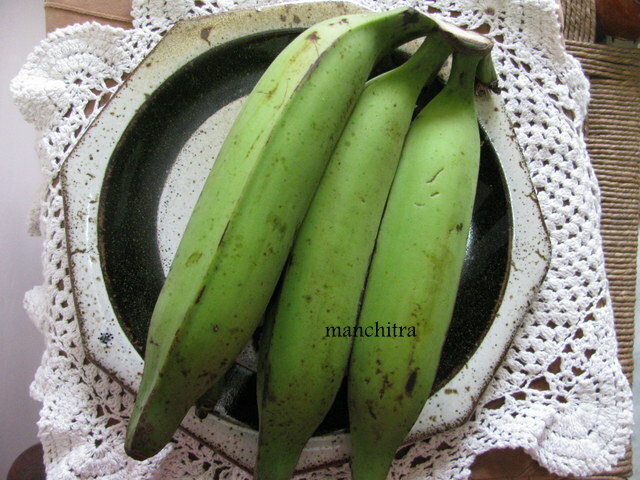 One would find bunches of these bananas in most of the shops .This finds a place in the daily menu of most of the households in Kerala as one pazham is sufficient to supply the required energy of a meal. Even during long travel where one is in a fix to find hotels, a single banana would be sufficient to refresh one. A little research on this fruit would amaze any one as how this humble fruit is used in preparing exotic dishes. Before I write about the fruit or pazham, I would say a little about the banana plant or tree too. This tree, right from top to bottom is useful in many ways. Do not know if there is any other tree that would beat this. Nothing is wasted or discarded even after the yield is over. Hence finding a banana tree in almost every house is not uncommon as its use in day today life is innumerable. The leaves of this tree are used as plates for serving food. In most weddings and big family functions in Kerala food is served on banana leaves. The grandeur of food served on broad leaves and feasting on sumptuous lunch cannot be expressed in words and one has to really feel and enjoy it. As the leaves are broad ‘n’ number of items can be served easily at one go. These leaves are also used in temples and for all auspicious ceremonies for making various offerings to the deity as they are easily available. I remember playing with mats made of banana leaves by splitting them into strands and at times the woven mat became our hand fans too. They also serve as excellent packing material. Packing lunch is very convenient and many people carry lunch to office in neatly folded banana leaves with an outer wrapping of newspaper.It smugly sits unobtrusively in the office bag. ‘Use and throw’ and no need to carry heavy food boxes while travelling. The stem of the tree is cut once the yield is over and the outer layers are dried and the fibers are used in making garlands and as binding material. The cut trees are also used as decorating materials during auspicious functions. The core of the stem is white and soft. They are used for making a variety of dishes. Stem minced and mixed with curds and chilies and seasoned with mustard and cumin becomes an excellent side dish with rice or chapathi. The juice of the stem is believed to have medicinal properties and is recommended for patients having kidney stones. The banana flower is also used in preparing various dishes .Myriad preparations can be made with raw as well as ripe bananas. 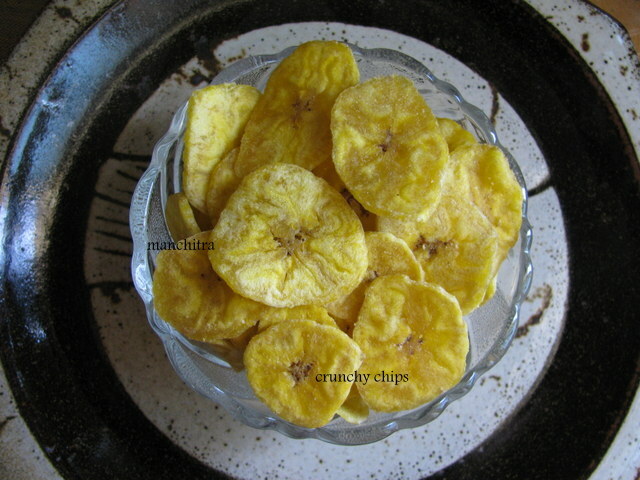 Raw banana is used in making chips or wafers. 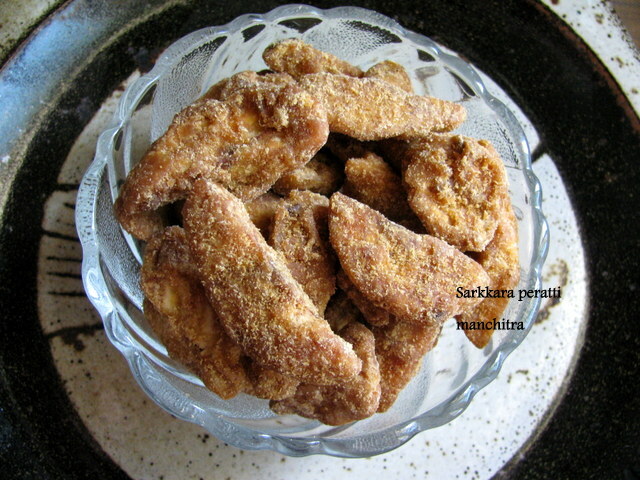 Raw bananas are also used in making a sweet snack known as sarkaraperatti. For this slightly thick banana pieces are fried in oil and later soaked in jaggery syrup with a dash of roasted cumin and dry ginger powder. Raw banana powder is an excellent baby food. 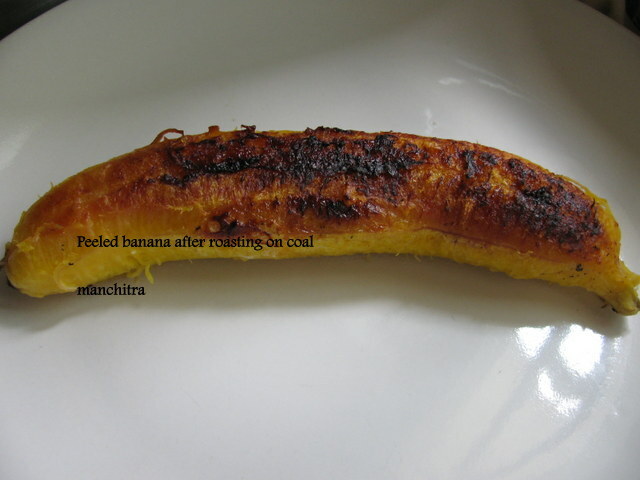 The skin of raw banana can be used in cooking. Surprising is it not? It has lot fibre and mixed with potatoes or coconut they become tasty dishes. I just buy raw banana for the sake of the skin. Nothing is wasted. 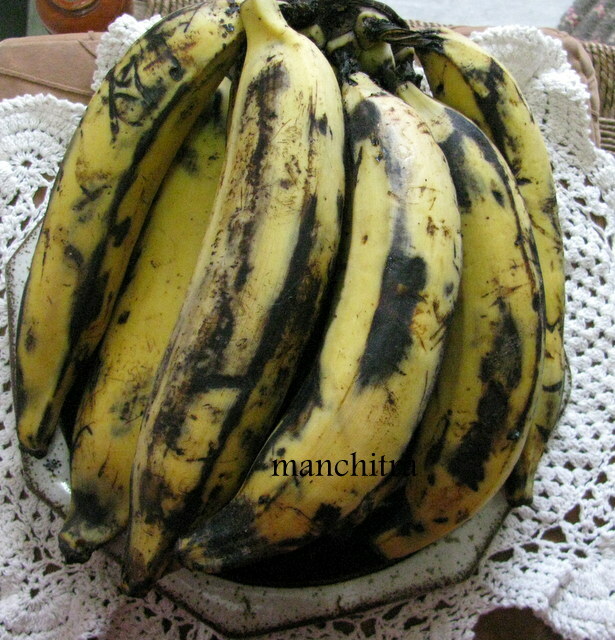 In the case of ripe banana skins they are mixed with fodder for cattle. I enjoy eating the ripe banana. A banana would quickly satiate the hunger pangs. 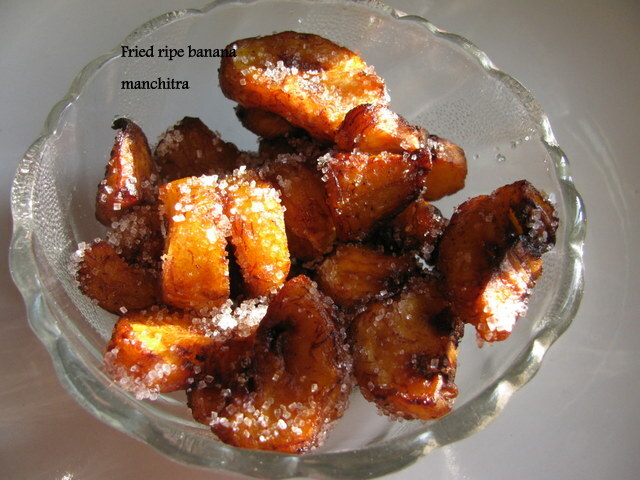 My favourite snack is pazham pori; ripe bananas are sliced fried with a coating of rice batter. 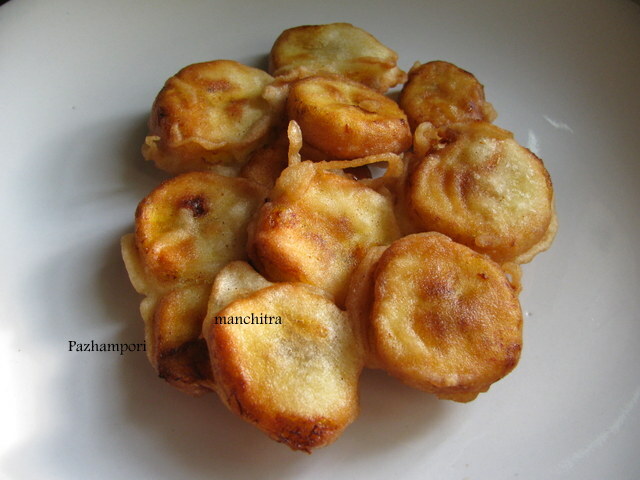 The crisp outer layer of the batter and soft texture of hot banana inside makes it a highly favourite snack for many. 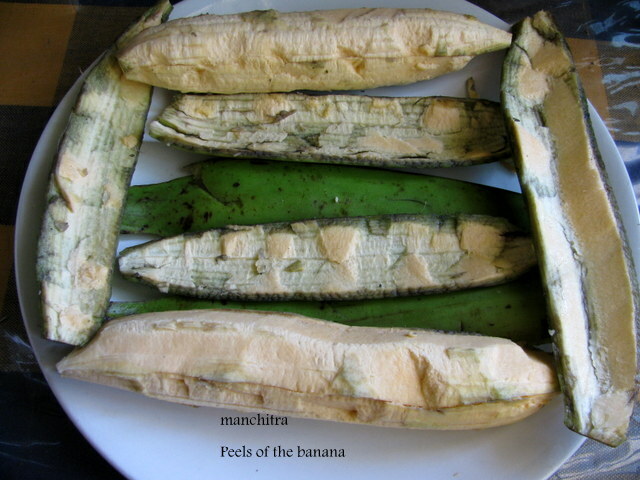 One would find this and steamed banana as a breakfast item in most of the village eateries in Kerala. 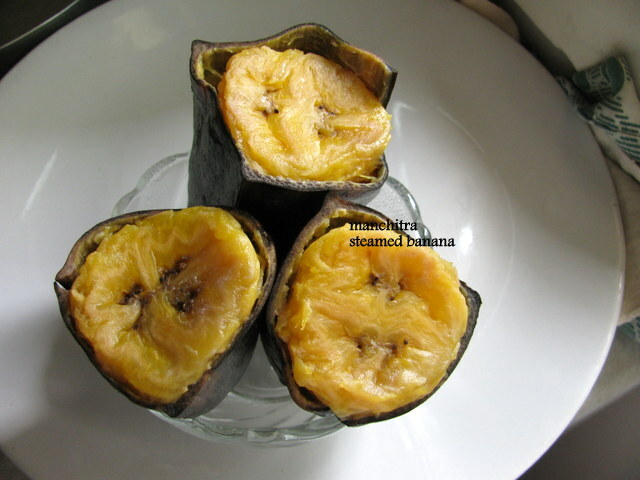 One can always experiment with banana and I believe there are ample varieties available as many have innovated and experimented with this pazham. 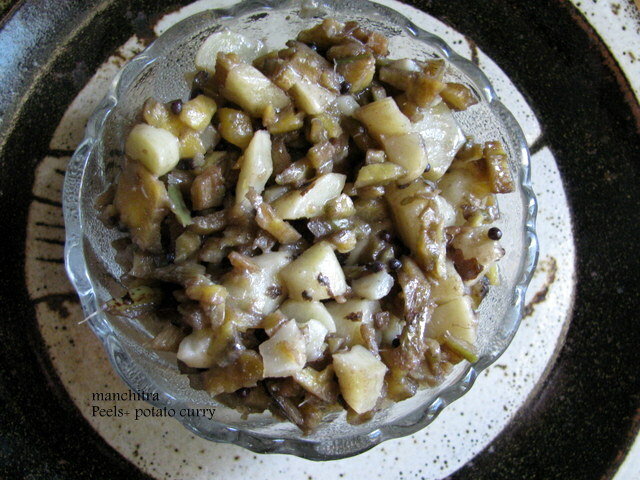 My mother used to dry the ripe ones in the hot Sun They shrivel and become very sweet like any other dry fruit They can be preserved for longer periods. . Banana halwa is yet another delicacy prepared by mixing it with sugar and ghee and cooking it on low flame by stirring continuously. Even the aroma is wafting from this is sufficient to make anyone drool. The halwa is soft, deep brown in colour and can be preserved for months together. But it is slow process of cooking it takes hours together to get this halwa done. Calicut town, in Kerala is famous for this halwa. 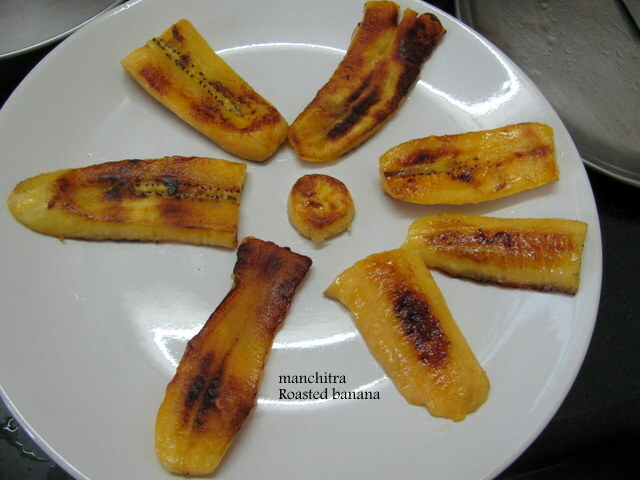 A quick snack to woo children is to fry ripe banana pieces in oil and sprinkling sugar over it while hot. The sugar melts and blends well with the pieces and nectar like syrup oozes out of it. Kids relish this as it sweet and colourful too. 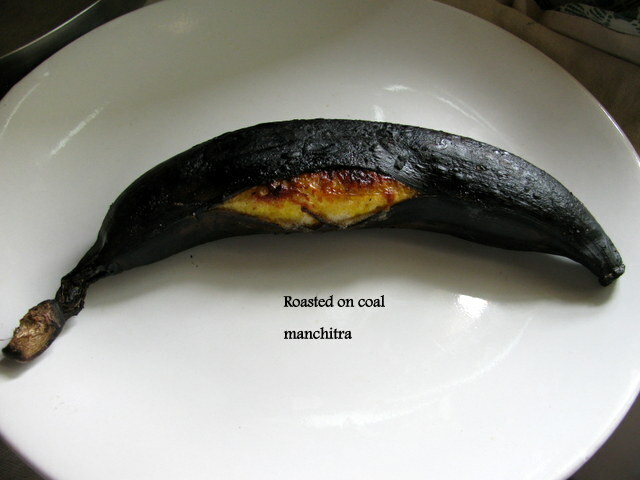 Bananas roasted directly over charcoal with the skin taste heavenly. The fruit becomes soft and it turns into nice golden brown colour. From the root of the tree more saplings emerge and it grows on its own. This needs very little care. What it needs is a little space in the corner of your garden. So remember the benefits and grow one if you have some space and once it comes into your life it stays forever unless or otherwise there are catastrophes like cyclone or heavy winds which would pull these trees down. Isn’t it amazing how nature has bestowed us with the best? Is it not wonderful too how people have learnt to put it to the best use? I never forget to fill my bags with this fruit whenever I set my eyes on it. I relish them and this trip it was no different.